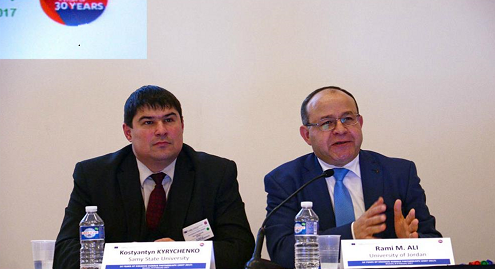 In the period of October 22-26, 2017 the representatives of Oleg Balatsky Academic and Research Institute of Finance, Economics and Management Nadiya Kostyuchenko and Denys Smolennikov took part in the international conference “Innovations for Sustainable Development” and started the traineeship under the program “Education for Sustainable Development” in Kaunas (Lithuania). The conference was organized by the Baltic University Program, the University of Abo Academy (Turku, Finland), Kaunas Technological University (Kaunas, Lithuania). Dr, Prof Іnna Shkolnik, the member of editorial board of “Financial Markets, Institutions and Risks” Journal took part in the XIV International Scientific and Practical Conference “Global Trends and Prospects for the Development of the Financial System of Ukraine” which was held on September 28-29, 2017 at the Faculty of Economics of the Kyiv National Taras Shevchenko University in the framework of the celebration of the 25th anniversary of the Department of Finance. Assistant Professor Larysa Sysoeva, the member of editorial board of “SocioEconomic Challenges” Journal, as a member of the Alfred Krupp Research Institute in Greifswald (Germany) participated in international symposiums, conferences and seminars, in particular in Germany and Italy in 2016-2017. Controlling in a sphere of energy consumption.